Boston.com's The Big Picture posts 2009's most amazing Guinness World Record holders. My favorite fanatics below. 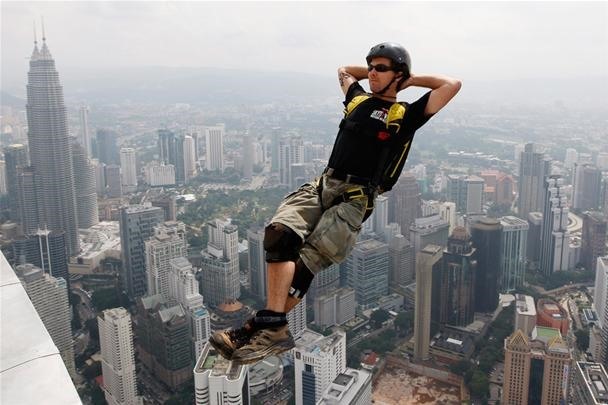 "A base jumper leaps backwards off the Menara Kuala Lumpur Tower, Malaysia, Wednesday, Oct. 28, 2009. A group of base jumpers were attempting to set a Guinness World Record striving to have 24 people base jump every hour for 24 hours from the the 915 feet high communication tower." "Joel Waul, 27, works nights restocking a Gap clothing store, and spent the last six years carefully wrapping and linking and stretching rubber bands of various sizes into the ball shape. The Guinness Book of World Records declared it the world's largest rubber band ball in 2008." "Street performer Chayne Hultgren (a.k.a. 'The Space Cowboy'), re-enacts his 18-sword swallowing attempt for a Guinness World Record in front of the Sydney Opera House on February 8, 2010. The Australian beat his own world record when he simultaneously swallowed 18 swords, each blade measuring 50.8cm by 1.3cm." 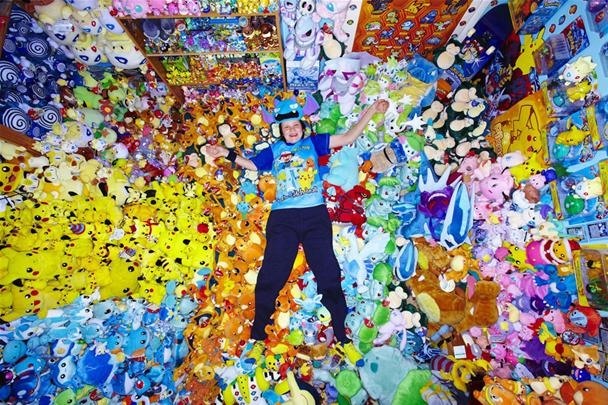 "Lisa Courtney lies amongst her collection - the Biggest Pokemon Memorabilia Collection in the world with 12,113 items, according to the Guinness Book of World Records." "Indian born British strongman Manjit Singh, 59, pulls a double decker bus using ropes attached to his hair in London, England on November 12, 2009. 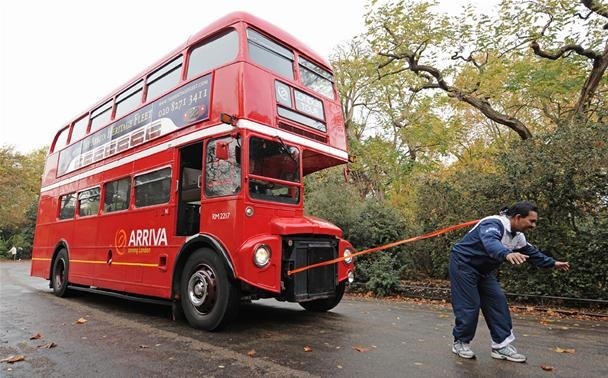 Singh broke the world record Thursday by pulling the bus a total of 21.2 metres." 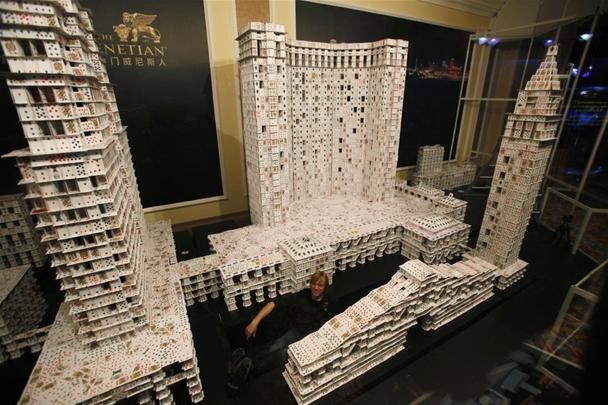 "Bryan Berg of the U.S. poses at his creation of the replica of The Venetian Macao-Resort-Hotel, as he breaks his own Guinness World Record for the largest house of Freestanding playing cards on Wednesday, March 10, 2010. Berg used 218,792 playing cards to build a replica of The Venetian Macao-Resort-Hotel during the 44 day project. The final composition is 35 feet long, 10 feet tall and weighs 272kg." "Around 15,000 people participate in a tug-of-war during an annual event in Naha, in Japan's southern island of Okinawa, on October 11, 2009. 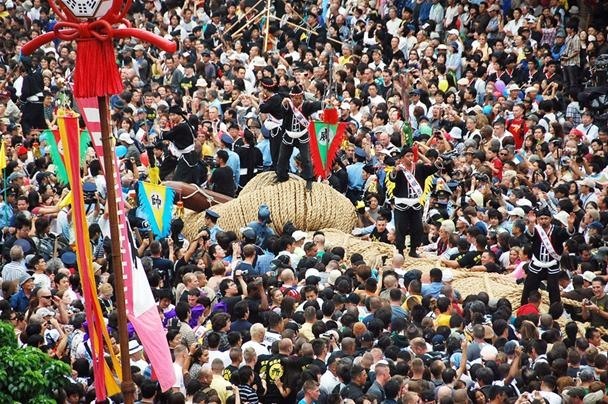 The rope used in the event - 200 meters long, 156 cms in diameter, weighing 43 tons and made from harvested straw - was recognized in the Guinness Book of World Records as the world's largest rope." 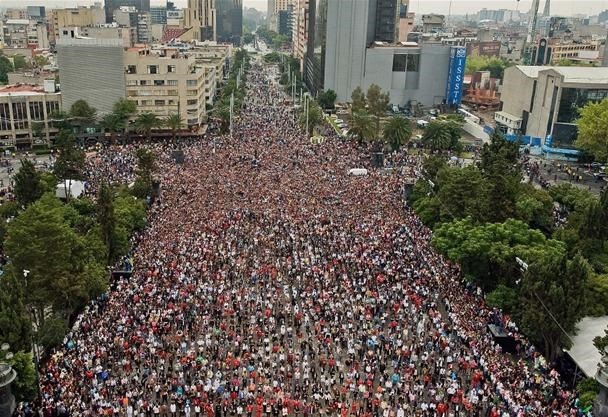 "Thousands of Mexicans take part in the 'I do dance Thriller' event which attempted to break the Guinness World Record for the biggest mass 'Thriller' dance, in Mexico City, on August 29, 2009. Up to 15,000 people were expected to take part in the mass performance on the day Michael would have turned 51." 2009's Most Amazing Scientific Images. All for the sake of breaking a world record huh?